The first accolade in the new Adr1ft “Clair de lune” trailer states, “Adr1ft brings your childhood dream of being an astronaut to life.” My childhood is a good many years behind me, but I can say with complete confidence that my dreams of being an astronaut (and I did, for the record, want to be one) did not ever include a bit about being trapped in low Earth orbit with no way to get home after my space station was destroyed in a horrific accident. Adr1ft will be out on Steam and the Oculus Rift on March 28. 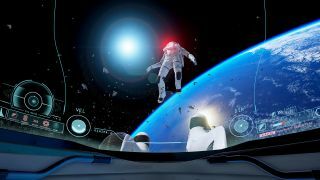 Find out more at adr1ft.com.